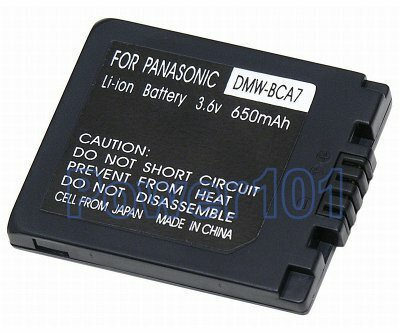 DMW-BCA7 battery is the same as Panasonic CGA-S001. It fits a number of Panasonic cameras such as: Panasonic Lumix DMC-F1, DMC-F1B, DMC-F1E, DMC-F1K, DMC-F1S, DMC-FX1, DMC-FX5, DMC-FX1EG-A, DMC-FX1EG-R, DMC-FX1EG-S, DMC-FX1GC-A, DMC-FX1GC-D, DMC-FX1GC-G, DMC-FX1GC-R, DMC-FX1GC-S, DMC-FX5, DMC-FX5EG-A, DMC-FX5EG-S. If you have a different camera, please check our camera compatibility list to find which battery you need. 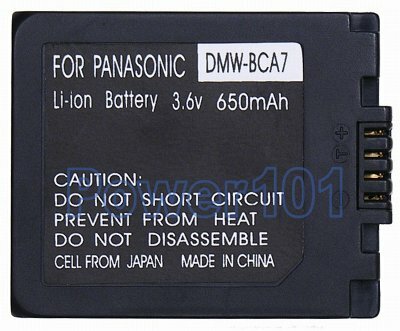 This battery can be charged by any standard chargers compatible with BCA7 or S001 batteries. Such as the charger that came with your camera.